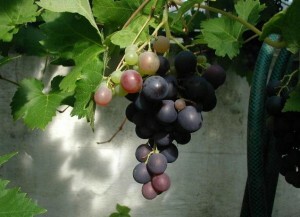 Wine grapes contain enough sugar — primarily glucose and fructose — to produce a fermented beverage of at least 9%, and usually higher, especially for reds. (12–13% ABV is typical for red wines, with many “blockbuster” California or Australian wine up around 15%.) At this alcohol content, wine can be kept for years without spoiling, in contrast to the grapes that made it. Most fruits, with the exceptions of figs, dates and a few others, do not contain this high level of sugar. So, in most cases, you must add sugar to your juice when making fruit wine. Sucrose (table sugar) is the most popular sugar used for this and you can use the potential alcohol scale on your hydrometer to ensure you are in the 9–11% ABV range, which works best from most country wines. Over the summer, we’ll take a look at some popular fruits — raspberries, cherries and peaches — and what it takes to make wine from them. What about regular Frozen Concentrate concord grape juice? Is this an acceptable place to start? You can make wine from supermarket frozen grape concentrate (or supermarket grape juice), but you probably won’t be thrilled with the quality. In the US, most red grape juice comes from Concord grapes and most white grape juice comes from Niagara grapes. If you make a wine from just frozen grape concentrate, it will likely be “foxy” — a description given to some wines made from American table grapes [and not (presumably) meaning that they taste like a small omnivorous canid that British people like to hunt]. Frozen grape concentrate, used sparingly, can give a nice “backbone” to a country wine. Fermented on it’s own, the results won’t be very interesting. For a wine made from only grapes, you’ll have much better results from a wine kit or a bucket of wine grape juice (presuming you don’t want to take the leap into full-on winemaking). Excellently constructed article, only when all blog writers supplied much the same information exactly like you, the net became a far more desirable desired detnosatiin. This summer has been great for the wild grape vines on my property, as well as my father-in-law’s. Being in Wisconsin, I’m guessing these are probably concord grapes. Based on the reading I’ve done, I may need to add both sugar and water to hit the right volume and gravity. Since I would have the skins and everything, would this allow for a more interesting wine versus one from concentrate? Thanks for all the information you’re providing. There’s really only one way to find out. You might want to try to get the grapes identified. They could be Concords, but there are other possibilities as well. If the grapes taste good, you could also use them to make a mead with grapes (a pyment, in the lingo). You’ve probably seen this, but Jack Keller has an outstanding website on making wine, and specifically many country wines. It has a ton of information and recipes. There’s not a lot in the way of testing, like what you and James often do with brewing, but I found it to be a great resource. Yes, Jack’s site is a great resource for home winemakers. I have discovered some what I believe are concord but am not sure they are seedless and very good but are kinda dark redish in color they are a little smaller in size please help me any suggestions on how to determine what type they are!